Pragmatically “useless” but visually rich: an obsolete flashbulb glows with window light. 1/80 sec., f/5.6, ISO 640, 35mm. A DECADE-AND-A-HALF INTO THE TWENTY-FIRST CENTURY, we are still struggling to visually comprehend the marvels of the twentieth. As consumers, we race from innovation to innovation so amazingly fast that we scarcely apprehend the general use of the things we create, much less the underlying aesthetic of their physical forms. We are awash in the ingenuity of vanishing things, but usually don’t think about them beyond what we expect them to supply to our lives. We “see” what things do rather than seeing their essential design. As photographers, we need not only engage the world as recorders of “reality” but as deliberate re-visualizers of the familiar. By selecting, magnifying, lighting and composing the ordinary with a fresh eye, we literally re-discover it. Second sight gives second life, especially to objects that have outlasted their original purpose. No longer needed on an everyday basis, they can be enjoyed as pure design. And that’s exciting for anyone creating an image. The above shot is ridiculously simple in concept. Who can’t recognize the subject, even though it has fallen out of daily use? But change the context, and it’s a discovery. 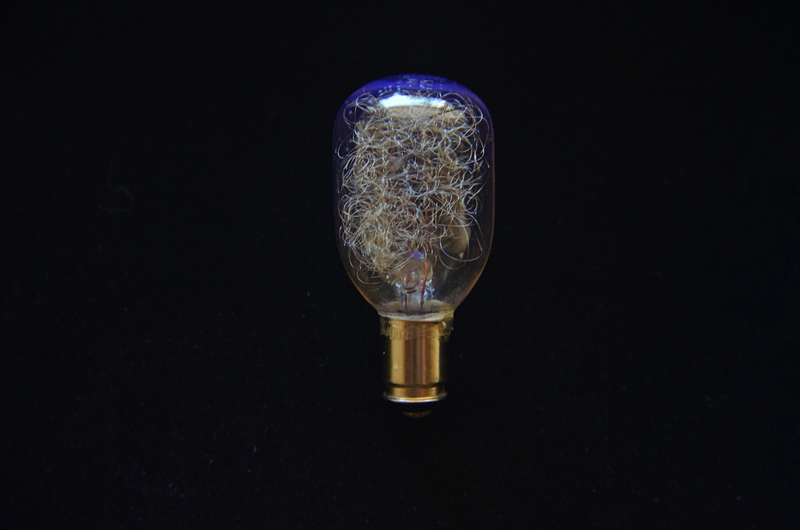 Its inner snarl of silvery filaments, designed to scatter and diffuse light during a photoflash, can also refract light, break it up into component colors, imparting blue, gold, or red glows to the surrounding bulb structure. Doubling its size through use of “the poor man’s macro”, simple screw-on magnifying diopters ahead of a 35mm lens, allows its delicate inner detail to be seen in a way that its “everyday” use never did. Shooting near a window, backed by a non-reflective texture, allows simple sculpting of the indirect light: move a quarter of an inch this way or that, and you’ve dramatically altered the impact. The object itself, due to the race of time, is now “useless”, but, for this little tabletop scene, it’s a thing made beautiful, apart from its original purpose. It has become something you can make an image from. Talk about a “lightbulb moment”…. This entry was posted on August 8, 2013 by Michael Perkins. It was filed under Abstract, Composition, Exposure, Framing, Lenses, Still Life and was tagged with Available Light, Composition, Diopters, Macro, Macrophotography. I visit day-to-day some web pages and information sites to read posts, however this blog presents quality based writing. Thank you so much for your recent comments. I truly appreciate your taking the time to check us out. Sorry to be so late in replying!